The buffer size question discussed in 2012 on the nanog list and is reproduced. Buffer requirements for long RTT networks is less well understood than you might hope. IETF tests for burst management are not as well developed as bandwidth tests. There is a draft that hints at progress. Packet pacing can improve buffer effectiveness by making TCP less bursty. Packet buffers and switch performance have shown steady improvement. This table attempts to show this for ASICs with integrated packet buffers and why using crufty old stuff is at your peril. Incast is a buffer exhaustion phenomena that is one consequence of running out of packet memory. Shared memory means that the hardware permits buffers to be used by any port that needs them. An intel white paper compares shared memory with other architectures. In a shared memory design it is not possible to let ALL the memory go to queued packets. There would be no room for new arrivals which would lead to head of line blocking. The other major option for a switch fabric is a crossbar matrix. Buffer queue depth monitoring cannot be done directly with SNMP MIB-II polling of the current occupancy of the buffer. Even if a buffer depth SNMP poll object existed it would not possible to interrogate it on a time scale short enough to catch microbursts. A burst that would fill a 4 MByte buffer would completely drain in 3.2 mS at 10 Gb/s. You could hope for indirect evidence of buffer exhaustion by monitoring packet drops. Bursts too short to cause drops can nonetheless be long enough to affect performance. Direct queue monitoring can thus add valuable information. 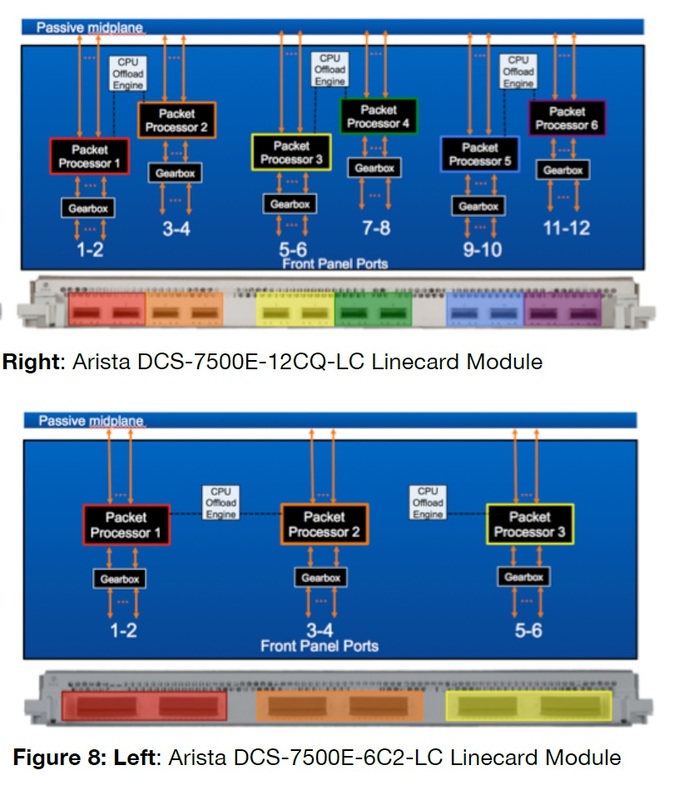 Some switches have multiple switch ICs that each manage their own memory pool. Examples are the Brocade FCX648S and the Cisco 3750-48. Memory from one IC can be shared among the ports in that IC's group but cannot be loaned out to ports controlled by other switch chips. Here we are interested in queue resources that can be claimed by a single flow for burst absorption -- not the total RAM in the system. Tolly (tolly.com) occasionally reports on the ability of switches to sustain microbursts in his reports on data center switches. These measurements relate directly to output port buffering. See esp the IBM G8264 below. Max buffer queue depth requires that all packet memory can be put into a single queue. QoS schemes divide buffer resources among defined queues. As such, I am not interested in the QoS descriptions and these are even less reliable than the rest of this doc. 2-port 100Gb/s module, 8-port QSFP module, . . .
12 MB to 1 port? Opinions herein are solely those of jim warner. The University has no opinions, and if they did, these would not be them.